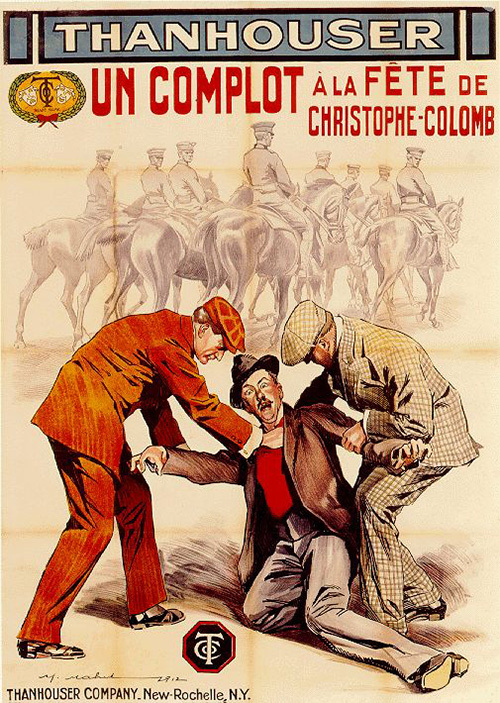 French Release Poster Image Courtesy Thanhouser Company Film Preservation, Inc. Location: Includes some scenes from the Columbus Day parade in New York City the preceding October. Some scenes were photographed in the East Side of Manhattan. Note: Mayor Gaynor was photographed as he performed his official duties during the October 1911 Columbus Day parade in New York City. "Features a stunning girl reporter who sets out on an interview and finds a conspiracy. The conspirator she trails only to lose him in the end. And it is very essential to the success of her anti-conspiracy plans that she knows where the lost conspirator is. The measure she adopts to regain trace of the quarry, who she knows is fast nearing his quarry with a deadly explosive, are thrilling and picturesque and are natural to her quick and clever mind...with New York's great Columbus Day parade." "An Italian nobleman, famed for his family and wealth, is among those invited to attend the Columbus Day celebration in New York. A bright young girl reporter's assignment for one of the newspapers is to learn from the count what he thinks of the city and its inhabitants. She calls at his hotel and is graciously received. Her visit is paid very shortly after the nobleman arrives, and while they are talking, one of the hotel porters enters with the trunk belonging to the count. When he sees the owner, he drops it with agitation, and there is mutual recognition. The reporter learns that the porter was formerly a servant of the count in Italy, but had been discharged for dishonesty. She is suspicious of the man, and is convinced that he means to harm his former employer; she warns the count, but he laughs at her fears. When the porter is discharged, she follows him from the hotel. She sees him enter an Italian restaurant in the poorer section of the city. "Disguised as an Italian dancing girl, she enters the place, and finds the former porter slightly intoxicated and in a garrulous mood. He gladly tells her his troubles, and boastfully declares that he will get even. He means to blow up the count with a bomb while he is seated on the grandstand during the parade, and is indifferent as to whether any other persons are injured or not. She goes to police headquarters and tells her story. The girl is stationed on the roof of a low building near the grandstand. It has been arranged that when she locates the man she will give a signal, to indicate the criminal. Her efforts are crowned with success. The half-crazy foreigner is neatly captured, and taken away by the police. Later they bring him before the count for identification, and the story of that girl's heroism comes out, and the count and the friends realize what she has done for them. The count takes from his coat a decoration that has been awarded him by his king for bravery, and pins it on the girl's breast. The others applaud and drink to the young woman's health. And the girl? Well, she has a 'dandy story' to tell the crowd in the 'city room' when she returns to her office." "Again the Thanhouser Company has cleverly woven an entertaining story around a public celebration, making a photoplay of more than passing note. A house servant of an Italian nobleman is caught in the act of trying to steal and is discharged. He goes to America. Later the nobleman crosses the sea and is the guest of honor at the New York celebration of Columbus Day. At his hotel he is interviewed by a reporter, a young woman. During the interview the former servant enters with his trunk and recognizes the count, at once threatening him. The girl follows the man to his lodgings and learns of a plot to blow up the count during the Columbus Day parade. She engages detectives and in the guise of an Italian girl learns the whole plan from the conspirators, follows them to the Columbus Circle, and there brings about their arrest at the crucial moment. The film shows much of the parade with intimate views of Mayor Gaynor and others reviewing the procession. It is exceptionally well played, is finely presented in its every scene and cannot fail to win approval wherever shown." "There is a wealth of good things in this big picture and melodrama. One of its features is the Columbus Day parade, recently held in New York City. One of the picture's central characters, an Italian count, was pictured as seated near the mayor of New York on the grandstand. An Italian who had been a servant in Italy and who had been discharged for theft, had made a conspiracy to kill him with a bomb. The girl reporter picked up the threat of the man's story while interviewing the count and followed him in disguise, finding out the whole plot. The skill with which the producer has woven the climax of his story around the reviewing stand, where the mayor's flag is fluttering and Mayor Gaynor is reviewing the passing troops, deserves to be pointed out. The parade which we see passing isn't thrown in; it and the mayor's presence add greatly to the story itself, and it is no easy job to find or make the means of catching such a scene so convincingly. It is a very interesting picture." "This company has proven itself exceptionally adept at bringing live features into its films in the way of events of public interest or particularly noteworthy background. The feature of this picture is the introduction of a Columbus Day parade held in New York City. Other scenes are taken on the East Side, giving a good atmosphere to the production as a whole. The story around this event has been carefully and dramatically woven in and makes from the manner in which it is done an exceptionally entertaining picture, though the woman reporter is a character more frequently found in fiction than in life. She meets an Italian count who had come to the country to take part in the Columbus Day celebrations. At the hotel where he stops is a porter who has formerly been discharged from his employ in Italy. The man is insulting him and is discharged. The reporter suspects him and, disguised as an Italian girl, she follows him to the saloon, where she learns that he intends to throw a bomb at the count as he sits in the grandstand. She puts detectives on the track and they arrive just in time to prevent the bomb from being sent on its mission."